Book Description: This textbook guides students through rhetorical and assignment analysis, the writing process, researching, citing, rhetorical modes, and critical reading. Guided by Oregon's statewide college writing outcomes, this book collects previously published articles, essays, and chapters released under Creative Commons licenses into one free textbook available for online access or print-on-demand. Created through a grant from Open Oregon in 2015-16, this book collects previously published articles, essays, and chapters released under Creative Commons licenses into one free textbook available for online access or print-on-demand. 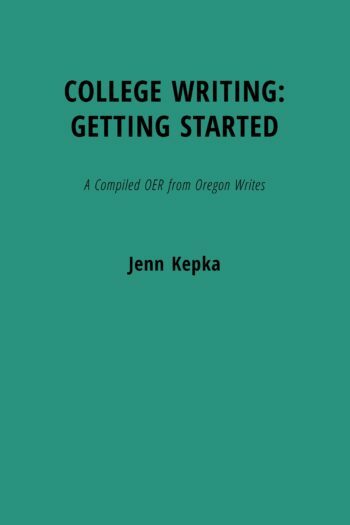 College Writing: Getting Started by Jenn Kepka is licensed under a Creative Commons Attribution 4.0 International License, except where otherwise noted. Except where otherwise marked, this text is licensed under a Creative Commons International 4.0 Attribution license by Jennifer Kepka/Oregon Writes.